L’Ecole No. 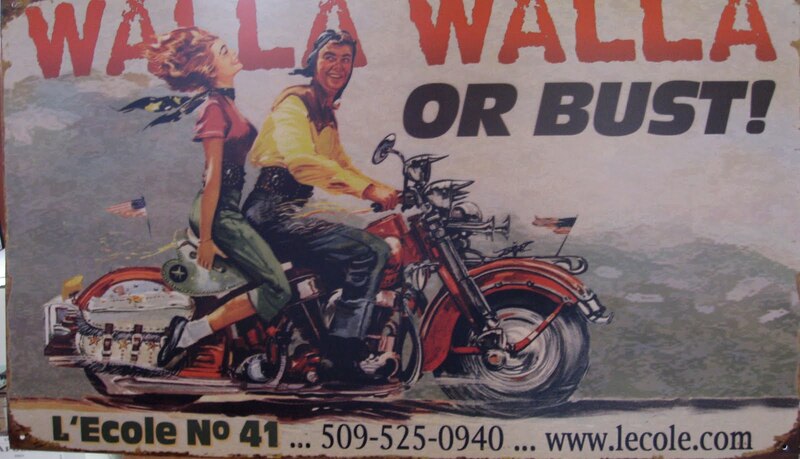 41 is located in Lowden, Washington, a short distance from Walla Walla. The winery was founded in 1983 by Jean and Baker Ferguson as the third winery in the Walla Walla Valley. L’Ecole is now owned by the Ferguson’s daughter and son-in-law, Megan and Martin Clubb, with Martin serving as the winemaker. 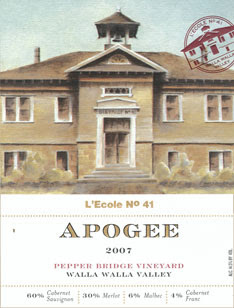 L’Ecole is located in an iconic, 1915 schoolhouse whose image adorns the winery’s labels. L’Ecole is relatively large compared to many Washington wineries, making approximately 30,000 cases annually. While many wineries may lose focus, quality, or both at this level, L’Ecole has excelled. The winery produces consistently high quality wines across a range of styles and price points. Winemaker Marty Clubb attributes this to a continued focus on vineyards, viticulture, and an artisan approach to winemaking. In a consistently high quality lineup, L’Ecole’s Walla Walla Valley-designated wines are particularly dazzling. The 2007 Walla Walla Cabernet Sauvignon is a beautiful expression of valley fruit from an exceptional vintage. The Apogee and Perigee, from Pepper Bridge and Seven Hills vineyards respectively, are appropriately named wines that showcase two of the valley's best vineyards. In contrast to many of their peers, these two Bordeaux-style blends are more about elegance than power and promise to only improve with years in the cellar. The 2007 Seven Hills Vineyard Syrah comes from three distinct blocks from this esteemed vineyard and is another example of why people are so excited about Washington Syrah. Starting with the 2007 vintage L’Ecole began blending the Seven Hills Vineyard Sémillon with a significant percentage of Sauvignon Blanc and rebranded the wine as ‘Luminesce’. In adding Sauvignon Blanc to this estate wine Clubb says, “In a warm site (such as Seven Hills), the difference in styles between sémillon and sauvignon blanc is so interesting. It creates a really unique blend.” L’Ecole has slowly increased its production of the Luminesce to over seven hundred cases annually. This has allowed the wine to enter national distribution channels while also providing an interesting counterpoint to Columbia Valley Sémillon. The national distribution is significant as there are few other Walla Walla Valley-designated white wines that receive wide national distribution. L'Ecole's wide reach may stand among the winery's biggest contributions to the Washington wine industry. The wines receive wide distribution, are instantly recognizable on the shelves, and live up to expectations in the glass. Every bottle is an ambassador for Washington wine. Rating: + (Good) Very pale lemon yellow. An appealing nose with toasted notes, mineral, and sweet spices. Crisp on the palate with a touch of tropical fruit accent by mineral notes. Oak shows through at times. 70% Sémillon, 30% Sauvignon Blanc. Seven Hills Vineyard. Aged in neutral French oak barrels with 30% malolactic fermentation. 14.2% alcohol. 789 cases produced. Rating: + (Good) Pale in color. A moderately aromatic nose with honeysuckle, mineral, and spice. A very even, well balanced palate, although shows a bit of alcohol at times. 100% Sémillon. Fries Desert Wind Vineyard. Aged in 20% new French oak for 4 months with partial malolactic fermentation. 14.2% alcohol. 360 cases produced. Rating: + (Good) Fairly light in color. A nose that announces that this wine is from Seven Hills Vineyard with earth, spice, bittersweet chocolate, and sweet oak spices. Tart and puckering with cherry fruit on the palate with a silky layer of oak in the background. 81% Merlot, 11% Cabernet Sauvignon, 8% Cabernet Franc. Seven Hills Vineyard. Aged 18 months in oak (40% new). 14.5% alcohol. 1,326 cases produced. Rating: * (Excellent) Fairly light in color. Beautiful aromatics with cedar, earth, pepper, red fruit and black fruit, and milk chocolate. Plush and soft on the palate with rich fruit flavors. 100% Cabernet Sauvignon. Estate Seven Hills, Loess, Va Piano, Pepper Bridge, and Yellow Jacket vineyards. Aged 22 months in small oak barrels (40% new). 14.5% alcohol. 2,327 cases produced. Rating: * (Excellent) An appealing, aromatic nose with red currant, cherries, raspberries, and red vines along with a touch of earth. Nicely put together on an elegantly structured palate. 56% Cabernet Sauvignon, 34% Merlot, 10% Cabernet Franc. Seven Hills Vineyard. Aged 22 months in small oak barrels (50% new). 14.4% alcohol. 1,627 cases produced. Rating: * (Excellent) A nose that pulls you in to the glass with spice, currant, black cherry, anise, and mint. A polished, even wine that flows seamlessly across the palate. 46% Cabernet Sauvignon, 42% Merlot, 8% Malbec, 4% Cabernet Franc. Pepper Bridge Vineyard. Aged 22 months in small oak barrels (50% new). 14.3% alcohol. 1,748 cases produced. Rating: * (Excellent) Prototypic Walla Walla aromas of earth, spice, herbal notes, and high-toned cherry along with a touch of milk chocolate. Elegant on the palate with soft tannins and restrained oak influence. Finish goes on and on. 60% Cabernet Sauvignon, 30% Merlot, 6% Malbec, 4% Cabernet Franc. Give two years. 60% Cabernet Sauvignon, 30% Merlot, 6% Malbec, 4% Cabernet Franc. Aged 22 months in small oak barrels (approximately 50% new). 14.5% alcohol. 1,630 cases produced. Rating: * (Excellent) An enjoyable nose with blueberry syrup, smoke, and a touch of smoked meat. A pleasurable palate with a lot of fruit and excellent balance. 100% Syrah. Aged 18 months in small oak barrels (30% new). 14.8% alcohol. 1,013 cases produced. Hey Sean, I heard that Willard Family Farms is in Prosser, near Royer Hill. All land in Prosser is outside the Rattlesnake Hills AVA. So, I'm guessing they have plots somewhere near Zillah? Also odd is that the 'Walla Voila' label states Columbia Valley, while the tasting notes state Rattlesnake Hills. Consistency? Thanks for pointing the label/tasting note difference on our Chenin Blanc. Willard Farms is near the Rattlesnake Ridgeline, however it is not part of the AVA. We have been sourcing from this vineyard for so long and talking about how it sits in the Rattlesnake Hills for so many years that I guess you could say old habits are hard to break. The Rattlesnake Hills AVA encompasses a small section of the ridgeline. I suppose we didn’t think about anything changing for us. Nonetheless we should have been paying more attention to how this could be confusing. Now that there is an approved AVA, we need to modify our fact sheet to eliminate confusion. Thanks again for pointing this out. You've explained why the tasting note is incorrect, how about the label? You used to label this wine Yakima Valley AVA, which was designated in 1983 and has always been the location of Willard Vineyards. Why did you change the label to Columbia Valley? Thanks for your note. We have never labeled the Chenin Blanc as Yakima Valley. From 1987 - 2006, it was labeled simply as Washington State. We changed the label to Columbia Valley with the 2007 vintage of Chenin Blanc. In the early years, all of our wines were all labeled as Washington State, and over time we migrated to labeling them as Columbia Valley. We began making wines from the Walla Walla AVA in 1993 and they are labeled as WW. As you probably know, most of WA AVAs are sub-appellations of the greater Columbia Valley. A winery may choose to label the wine as the specific sub-appellation or encompassing Columbia Valley. In this instance we have chosen Columbia Valley. Hope that clears everything up. Jaime, thanks for the insight. As you can tell, folks love this 'insider's baseball' about vineyards, labeling decisions and the like. Much appreciated. Jaime, Adding my thanks for clarifying the questions about Walla Voila. 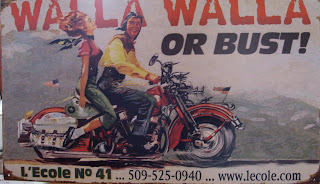 I sent an e-mail to your attention at L'Ecole for some more follow-up.